The days of overcrowded clunky keychains encumbering purses and pockets are fading into the past. Technology is moving by the necessity of the actual lock-and-key solution in a number of vertical market spaces. Today, we’re seeing an emergence of key fobs for cars with push-start buttons, and a move towards digital security, mobile credentials, keypads, and biometric access control, such as fingerprint and facial recognition, and even iris detection. The evolution of the credential has been moving toward a more secure technology. The industry started with technologies like magstripe, which was a low-cost access control solution. Many of these systems are still in place within the higher education market; but with low cost and this “affordable” option comes virtually no security. To put things in perspective, think about your credit cards. In the last few years, we’ve gone from magstripe credit cards, which can be easily copied, to EMV chips, or smart chips. These chips secure information at a much higher level. Going further than access control, companies and institutions are looking for innovative ways to transcend beyond traditional security measures and methods, improve efficiency and cost, and maximize convenience. One such sophisticated technology solution that can achieve these goals is the utilization of smart cards. Smart cards can act as electronic key rings with data storage capacity and reliable personal identification capability. 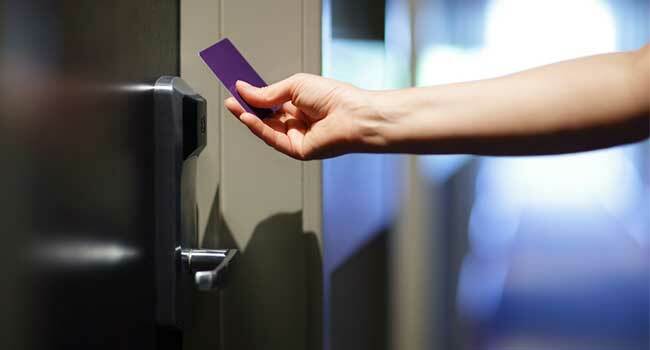 Institutions, such as higher education facilities, actively use smart cards for access purposes such as entry to administrative and classroom buildings, residence areas and dormitories, dining facilities, and computer labs. Along these lines, we’re starting to see the rise of virtual smart cards, which is technology that can be ported to different types of media like cards, fobs, wearable devices or mobile phones as long as they have a chip in them that can securely store the credential data.